Type nothing and just hit the search button. The search results page will give you another option. If you enter nothing in the search box (or actually forget), the search results page will present you with a list of categories for all of our products. Click on the category that seems closest to what you're looking for. Once you have a list of results, you will see some links on the left side of that page to refine your search. 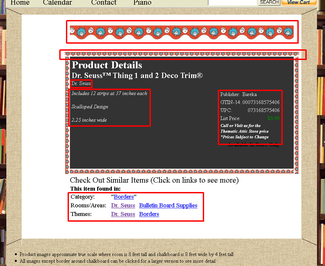 We organize our products by category, room and theme as if you were in our store. In our store we have several rooms or areas where products are grouped together. For example, if you are looking for something related to Math, you can visit the math area. if you are interested in History, you can visit the History room. Within each area or room you will find items further organized by theme. If your initial set of results is large, the list of rooms / areas and the list of themes may be long. Just click on the room and theme that is closest to what you seek and the results will be reduced to just the related items. 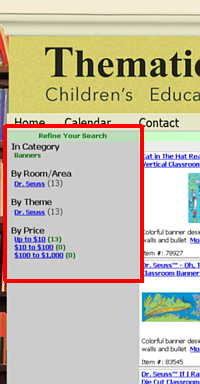 You can also select a price range to further limit your search. First, you'll want to click on either the title, product photo or "More ..." elpsis to see a page showing further details. 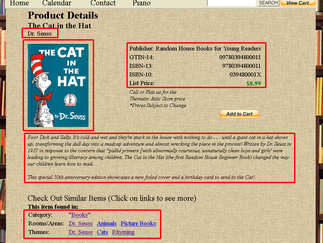 Depending on the product, there are a couple of different styles of detail pages you may see. In most cases, you will see our standard product details page with a larger product image and details like the author and publisher or manufacturer of the item as well as a description. Below that, you will find what we call the "Expansion Search" links. 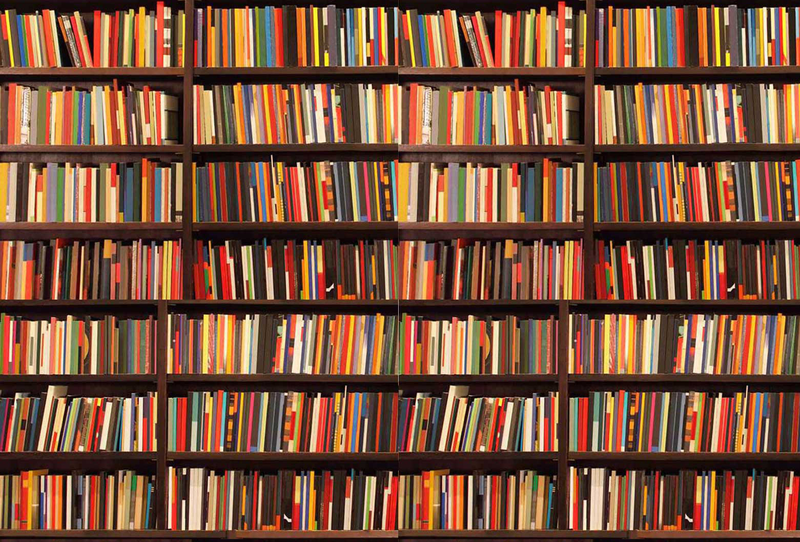 These are the category, rooms and themes in which this product can be found. If you click on one of those links, for example one of the rooms, you will get a new search page with all items that can be found in that room. This can be a good method for finding items you might not have considered when doing your original search. Who knows, you might find just the right item for that special someone you're shopping for. SPECIAL FEATURE: Since a number of our customers are teachers, if the product could be used to decorate a classroom, the product details may be shown on a special classroom page. This page was designed to give teachers an idea of what the product might look like in a classroom setting. Of course, you can use the product pretty much any way you want. We just wanted to help the imagination along a bit. It should be noted that on that special page, since some product images are either much longer or taller than than they are wide, the standard product images tend to be scaled down to a point where it's hard to see the detail. Borders are rendered around the chalkboard, but also show at the top of the room like a banner and that image can be clicked on to see our largest version for more detail. Banners, Posters and other large vertical items will be rendered to the left of the chalkboard and can also be clicked on for a larger version of the product image. 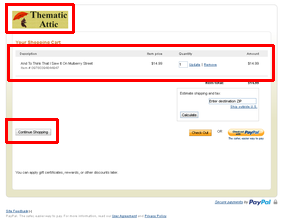 Once you find an item you like, look for the "Add to Cart" button and click it. You are not paying yet, you are simply adding it to your shopping cart like you would at any store before you go to the checkout. If you see "In Store Only" instead, that means we do not sell that item online ... at least not at this time, but we do carry it in store. When you click the button the first time, a new window or tab will open and show you the contents of your shopping cart. Your original window will remain open so you can continue to search for other items. You can also close the shopping cart window at any time if it's getting in the way. You will always be able to bring it up again. From this page you can either choose to checkout or click the "Continue Shopping" button to close the window and return to your search. Closing the window will NOT affect your cart. The contents should remain until you are ready to check out as long as you continue with the same computer and have cookies** enabled (most people do). When you have all the items you would like to purchase in your cart, you can proceed to checkout. If you still have the shopping cart page open, you can click on the "Checkout" button. Otherwise, look for the "View Cart" button next to the search box on the menu line (on our website) and click that, which will open the shopping cart window/tab. You can then click the "Checkout" button to proceed. On the checkout page you will be able to update the quantities of the items in your cart and you can enter your zip code to find out how much tax (where applicable) and shipping will cost as well as the total for your order. 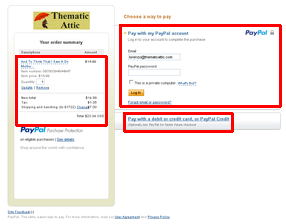 It's also from this page that you can eiter login to a PayPal account or use a credit card to pay. If you don't have a PayPal account you'll have to enter in your billing and shipping addresses and email address. Once you've placed your order, you will get a confirmation email at the address you provide. Then we'll pack and ship your items and notify you when they're on the way. *As with any other business, it should be noted that our prices are subject to change as our suppliers do periodically change their prices to us. **Cookies are a standard feature of the world wide web. They allow a website to store information on your computer that only that website can access. They are necessary to keep track of things like the contents of your shopping cart. PayPal is the company that maintains our shopping cart and thus they are the only website that can access the contents of your shopping cart. They do however provide us with notices when orders come in so we know what to ship and to where, but no financial or other personal information. If you have any concerns, please feel free to visit paypal.com to view their privacy policies.